The “Christmas Cold” is finally making it’s way into the Dandy household so I’ve been having a rather sore throat and cough the last couple of days. 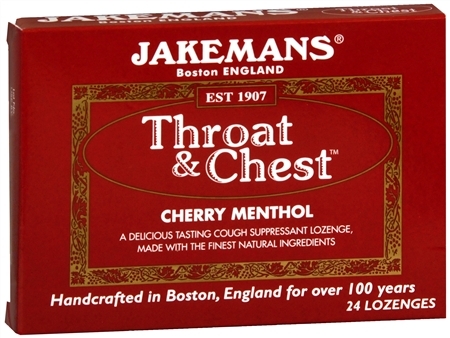 After swinging into Tops to pick up some medicine I spotted this very handsomely designed cough drop package called Jakemans Throat & Chest and had to buy it. What can I say, I’m a sucker for good design. Established in 1907, Jakemans is a privately owned, independent company specializing in quality menthol based confectionary. Based in Boston, England they use all natural ingredients and come in a three flavors: Honey and Lemon, Cherry, and Anise. I have to say they work quite well. After having one my throat instantly felt better and the taste was actually quite pleasant. They will cost more than your average package of Halls, but what you get in return is a truly Dandy looking package of cough drops.